Android-wielding Xbox fans, rejoice! Microsoft debuted a version of its My Xbox Live app for the platform Wednesday. Also released: A significant upgrade to the iOS version of the app. 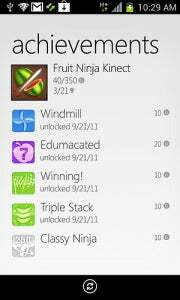 The Android version of My Xbox Live brings features that iPhone and Windows Phone users have had for awhile. The Android app is a bit rough around the edges, but it’s a start. Users will be able to send and receive messages from their Xbox Live accounts, manage their friends list, edit their profile, adjust their avatar, and review achievement information. These features mirror what has already been available to iOS for quite some time. The company did not say when it anticipated Android users will gain access to more advanced functions, although it did note the app itself will only work on select phones. If you read the app’s page on Google Play, the app is available for most Android 2.2+ smartphones, with WGVA screen resolution or higher. However, you don’t find out until you attempt to run the app after installing it if your phone doesn't qualify. That appears to have angered some. You must also, of course, have an Xbox LIVE account to sign in. The cool new features go to the My Xbox Live for iOS app, where the improvements mirror functions available in Windows Phone’s Xbox Companion app. Windows Phone users have been able search and control content from their devices, and the iOS app will now be able to do the same. The iOS app now acts a remote which can navigate through the Xbox 360 menus as well as play, pause, rewind, or fast forward through content. The remote allows you to navigate through menus and content on your Xbox via your iOS device. The iPad version of the app is also getting a refresh, including Retina Display support and improved sign-in controls. While this may sound a lot like SmartGlass--Microsoft’s effort to ease the sharing of content across multiple devices -- it is not. Instead, this update is more about bringing the feature set of the iOS version of My Xbox Live closer to its Windows Phone counterpart.